باتوجه‌به میزان بالای اسیدهای چرب غیراشباع موجود در عضلۀ ماهی و افزایش تقاضای مواد غذایی آمادۀ مصرف مثل ناگت، اثر عصارۀ جلبک قهوه‌ای (Iyengaria stellate) بر عمر ماندگاری و خواص حسی فیلۀ ناگت ماهی قزل‌آلای رنگین‌کمان (Oncorhynchus mykiss) طی نگهداری در فریزر (18- درجۀ سانتی‌گراد) بررسی شد. تیمارهای موردبررسی شامل: شاهد (فیلۀ ناگت بدون غوطه‌وری در محلول عصارۀ جلبک) و سایر موارد (فیلۀ ناگت با غوطه‌وری در محلول 1، 2 و 3 درصد عصارۀ جلبک) بود. ویژگی‌های شیمیایی و فیزیکی ناگت ماهی قزل‌آلای رنگین‌کمان پس از اعمال تیمار و نیز طی زمان صفر، 1، 2 و 3 ماه نگهداری در دمای 18- درجۀ سانتی‌گراد صورت پذیرفت. طبق نتایج طی دورۀ نگهداری در تمامی تیمارها میزان بازده و رطوبت کاهش یافت. اما در تمام تیمارها طی دورۀ نگهداری میزان چربی و چروکیدگی کاهش معنی‌دار (0/05>P) و میزان پراکسید (PV)، اسید چرب آزاد (FFA) و تیوباربیتوریک اسید (TBA) افزایش معنی‌داری را نشان دادند (0/05>P). در پایان دورۀ نگهداری، بیشترین میزان بازده، پیوستگی بافت، شاخص روشنایی (L)، شاخص زردی (b)، کمترین میزان چروکیدگی، قابلیت ارتجاعی، خاصیت چسبندگی بافت و چربی متعلق به تیمار 1 درصد بود. ازطرفی بیشترین میزان سختی، خاصیت چسبندگی، نیروی چسبندگی، قابلیت جویدن بافت، شاخص قرمزی (a) و کمترین میزان رطوبت،FFA ، PV، TBA و نیروی چسبندگی تحت تیمار 3 درصد حاصل شد. بنابراین، کاربرد عصارۀ جلبک قهوه‌ایبه میزان 3 درصددر کاهش نرخ فساد شیمیایی و بهبود وضعیت حسی فیلۀ ناگت ماهی قزل‌آلای رنگین‌کمان طی نگهداری در دمای 18- درجۀ سانتی‌گراد بهترین عملکرد را نشان داده است. اجاق، م.، کاظمی‌نیا، س.، جمشیدی، ا. و شعبان‌پور، ب. 1392. اثر دماهای مختلف سرخ‌کردن مقدماتی در روغن کانولا بر کیفیت و مقدار جذب روغن در قسمت‌های مختلف ناگت ماهی کپور نقره‌ای (Hypophthalmichthys molitrix). مجله بهره‌برداری و پرورش آبزیان، 2: 43-59. پروانه، و. 1377. کنترل کیفی و آزمایش های شیمیایی مواد غذایی. انتشارات دانشگاه تهران، 332 ص. پیمانی، ج.، قرایی، الف.، غفاری، م. و طاهری، ع. 1393. بررسی اثرات ضدباکتریایی و ضدقارچی جلبک (Gracilaria arcuata) از سواحل چابهار. مجله دانشگاه علوم پزشکی قم، 8: 69-75. شعبان‌پور، ب.، ذوالفقاری، م.، فلاح‌زاده، س. و علی‌پور، غ.ح. 1390. اثر عصارۀ آویشن شیرازی (Zataria multifora Boiss) بر مدت ماندگاری فیلۀ ماهی قزل‌آلای رنگین‌کمان (Onchoryncus mykiss) شور و بسته‌بندی‌شده در خلأ در شرایط یخچالی: ارزیابی میکروبی، شیمیایی و حسی. فصلنامه علوم و صنایع غذایی، 1: 11-1. محمدی، ع.، شعبانپور، ب. و کردجزی، م. 1395. ارزیابی فعالیت ضداکسیدانی و ضدباکتریایی جلبک قهوه‌ای (Iyengaria stellata) جمع‌آوری‌شده از سواحل خلیج فارس. نشریه فیزیولوژی و بیوتکنولوژی آبزیان، 3: 1-15. Akdeniz, N., Sahin, S., & Sumnu, G. 2006. Functionality of batters containing different gums for deep-fat frying of carrot slices. Food Engineering, 75(4):522-526. Alasalvar, C., Taylor, K.D.A., Oksuz A., Garthwaite, T., Alexis, M.N., & Grigorakis, K. 2001. Freshness assessment of cultured sea bream (sparus aurata) by chemical, physical and sensory method. Food Chemistre, 72(1):33-40. Albert, A., Perez-Munuera, I., Quiles, A., Salvador, A., Fiszman, S.M., & Hernando, I. 2009. Adhesion in fried battered nuggets: performance of different hydrocolloids as predust using three cooking procedurers. Food Hydrocolloids, 23(5):1443-1448. Albert, A., Varela, P., Salvador, A., & Fiszman, S.M. 2009. Improvement of crunchiness of battered fish nuggets. Journal of Eruopean Food Research Technology, 228(6):923-930. Altunakar, B., sahin, S., & Sumnu, G. 2006. Effect of hydrocolloids on apparent viscosity of batters and quality of chichen nuggets. Chemical Engineering Communication, 193(6):675-682. De Abreu, D.A.P., Maroto, J., Rodriguez, K.V., & Cruz, J.M. 2012. Antioxidant from barley husks impregnated in films of low-density polyethylene and their effect over lipid deterioration of frozen cod (gadus mohua). Journal of Food Science and Agriculture, 92(2):427-432. Bouga, M., & Combet, E. 2015. Emergence of seaweed and seaweed-containing food in the UK: focus on labeling, lodine content, toxicity and nutrition. Journal of Foods, 4(2):240-253. Cakli, S., Kilinc, B., cadum, A., Dincer, T., & Tolasa, S. 2006. Effect of gutting and ungutting on microbiological, chemical, and sensory properties of aquacultured sea bream (sparus aurata) a sea bass (dicentrarchus labrax) stored in ice. Journal of Food Science and Nutrition, 46(7):519-527. Chaijan, M., Benjakul, S., & Visessanguan, W. 2006. Changes of lipids in sardine (sardinella gibbosa) muscle during iced storage. Food Chemistry, 99(1):83-91. Chen, H., & Huang, Y. 2008. Rheological properties of HPMC enhanced surimi analyzed by small and larg-strain tests-II: effect of water content and ingredients. Food Hydrocolloids, 22(2):313-322. Chen, S.D., Chen, H.H., Chao, Y.C., & Lin, R.S. 2009. Effect of batter formula on qualities of deep-fat and microwave fried fish nuggets. Journal of Food Engineering, 95(2):359-364. Keshri, R.C., & Sanyal, M.K. 2007. Effect of sodium alginate coating with preservatives on the quality of meat patties during refrigerated (4 ±1°C) storage. Journal of Food Muscle, 20(3):275-292. Chytiri, S., Chouliara, I., savvaidis, I.N., & Kontominas, M.G. 2004. Microbiological, chemical and sensory assessment of iced whole and filleted aquacultured rainbow trout. Journal of Food Microbiology, 21(2):157-165. Cox, S., Abu-Ghannam N., & Gupta, S. 2010. An assessment of the antioxidant and antimicrobial activity of six species of edible irish seaweeds. International Food Research Journal, 17:205-220. Das, A.K., Anjaneyulu, A.S.R., Gadekar, Y.P., Singh, R.P., & Pragati, H. 2008. Effect of full-fat soy paste and textured soy granules on quality and shelf-life of goat meat nuggets in frozen storage. Journal of Meat Science, 80(3):607-614. Erkan, N., Ozden, O., Alakavuk, D.u., Yidirim, S.y., & Lnugur M. 2006. Spoilage and shelf life of sardines (sardina plichardus) packed in modified atomospher. Journal of European Food Research Technology, 222:667-673. Fan, W., Sun, J., Chen, Y., Qiu, J., Zhang, Y., & Chi, Y. 2009. Effects of chitosan coating on quality and shelf-life of silver carp during frozen storage. Food Chemistery, 115(1):66-70. Igan, J.O., King, J.A., Pearson, A.M., & Gray, I.I. 1979. Influence of heme pigments, nitrite and nonheme iron on development of warmed-over flavore (WOF) in cooked meat. Journal of Agriculture and Food Chemistry, 27(4):838-842. Jain, D., pathar, P., & manikanta, M. 2007. Evalution of texture parameters of rohu fish (Labeo rohita) during iced storage. Journal of Food Engineering, 81(2):336-340. Kester, J.J., & Fennema, O.R. 1986.Edible films and coatings: a review. Journal of Food Technology, 43:2839-2845. Kilinc, B., Cakil, s., Cadum, A., & Sen, B. 2009. Effect of phosphate dip treatments on chemical, microbiological, color, textural, and sensory changes of rainbow trout (onchoryncus mykiss) fillets during refrigerated storage. Journal of Food Product Technology, 18(1-2):108-119. Killincceker, O., & Hepsag, F. 2012. Edible coating effects of fried potato balls. Journal of Food and Bioprocess Technology, 5(4):1349-1354. Kostaki, M., Giatrakou, V., Savvaidis, I.N., & Kontominas, M.G. 2009. Combined effect of MAP and thyme essential oil on the microbiological, chemical and sensory attributes of organically aquacultured sea bass (dicentrarchus labrax)fillets. Journal of Food Microbiology, 26(5):475-482. Kuda, T., Taniguchi, E., Nishizawa, M., & Araki, Y. 2002. Fate of water- soluble polysaccharides in dried Chorda filum a brown alga during water washing. Journal of Food Composition and Analysis, 15(1):3-9. Lim, S.N., Cheung, P.C.K., Ooi, V.E.C., & Ang, P.O. 2002. Evalution of antioxidative activity of extract from a brown seaweed, sargassum siliquastrum. Journal of Agriculture and Food Chemistry, 50(13):3862-3866. Lin, C.C., & Lin, C.S. 2005. Enhancement of the storage quality of frozen bonito fillet by glazing with tea extracts. Journal of Food Chemistry, 16(2):169-175. Lu, F., Liu, D., Ye, X., Wei, Y., & Liu, F. 2009. Alginate-calcium coating incorporating nisin and EDTA maintains the quality of fresh northern snakehead (channa argus) fillets stored at 4°C. Journal of the Science of Food and Agriculture, 89(5):848-854. Luo, Y., Shen, H., Pan, D., & Bu, G. 2008. Gel properties of surimi from silver carp (hypophthalmichthys molitrix) as affected by heat treatment and soy protein isolate. Journal of Food hydrocolloids, 22(8):1513-1519. Maftoonazad, N., Ramaswamy, H.S., & Marcotte, M. 2008. Shelf-life extension of peaches through sodium alginate and methyl cellulose edible coatings. Journal of Food Science and Technology, 43(6):951-957. Maskat, M.Y., Yip, H.H., & Mahali, H.M. 2005. The performance of a methyl cellulose-treated coating during the frying of a poultry product. Journal of Food Science and Technology, 40(8):811-816. Masniyom, P., Benjakul, S., & Visessanguan, W. 2005. Combination effect of phosphate and modified atmosphere on quality and shelf-fish extension of refrigerated seabass slices. LWT-Food Science and Technology, 38(7):745-756. Mendes, R., & Goncalvez, A. 2008. Effect of soluble CO2 stabilisation and vacuum packaging in the shelf life of farmed sea bream and sea bass fillets. Journal of Food Science and Technology, 43(9):1678-1687. Modi, V.K., Sachindra, N.M., Nagegowda, P. Mehendrakar, N.S., & Rao, D.N. 2007. Quality changes during the storage of dehydrated chicken kebab mix. International Journal of Food Science and Technology, 42(7):827-835. Ojagh, S.M., Rezaei, M., Razavi, Sh., & Hosseini, S.M.H. 2010. Effect of chitosan coating enriched with cinnamon oil on the quality of refrigerated rainbow trout. Food Chemistry, 120(1):193-198. Ozogul, Y., Ozyurt, G., Ozogul, F., Kuley, E., & Polat, A. 2005. Freshness assessment of European (anguilla anguilla) by sensory, chemical and microbiological methods. Food Chemistry, 92(4):745-751. Pantazi, D., Papavergou, A., Pournis, N., Kontominas, M.G., & Savvaidis, I.N. 2008. Shelf-life of chilled fresh mediterranean swordfish (Xiphias gladius) stored under varius packaging condition: Microbiological, biochemical and sensory attributes. Journal of Food Microbiology, 25(1):136-143. Papadopoulos, V., Chouliara, I., Badeka, A., Savvaidis, I.N., & Kontominas, M.G. 2003. Effect of gutting on microbiological, chemical, and sensory properties of aquacultured sea bass (dicentrarchus labrax) stored in ice. Journal of Food Microbiology, 20(4):411-420. Park, P.J., Shahidi, F., & Jeon, Y, J. 2004. Antioxidant activities of enzymatic extracts from an edible seaweed sargassum horneri using ESR spectrometry. Journal of Food Lipids, 11(1):15-27. Piras, C., Scano, P., Locci, E., Sanna, R., & Marincola, F.C. 2014. Analysing the effects of frozen storage and processing on the metabolite profile of raw mullet roes using 1H NMR spectroscopy. Food Chemistry, 159:71-79. Remya, S., Basu, S., Venkateshwarlu, G., & Mohan, C.O. 2015. Quality of shrimp analogue product as affected by addition of modified potato starch. Journal of Food Science and Technology, 52(7):4432-4440. Rezaei, M., & Hosseini, S.F. 2008. Quality assesssment of farmed rainbow trout (oncorhynchus mykiss) during chilled storage. Journal of Food Science, 73(6):93-96. Rodriguez, A., Carriles N.M., Cruz, J., & Aubourg, P. 2008.Changes in the flesh of cooked farmed salmon (oncorhynchus kisutch) with previous storage in slurry ice (-1.5°C). LWT-Food Science and Technology, 41(9):1726-1732. Sahin, S., Summu, G., & Altunakar, B. 2005. Effects of batters containing different gum types on the quality of deep-fat fried chicken nuggets. Journal of Food Science and Agriculture, 85(14):2375-2379. Jeya, S.R., Jeyasekaram, G., & Vijayalakshmi, S.K. 2005. Effect of vacuum packaging on the quality characteristics of seer fish (scomberomorus commersonii) chuks during refrigerated storage. Journal of Food Science and Technology, 42(5):438-443. Tokur, B., Ozkutuk, S., Atici, E., Ozyurt, G., & Ozyurt, C. 2006. Chemical and sensory quality changes of fish fingers, made from mirror carp (cyprinus carpio L., 1758), during frozen storage (-18°C). Food Chemistry, 99(2):335-341. 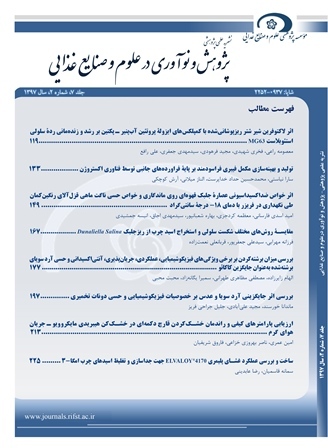 Tolouie, H., Mohtadi Niab, J., Shakibi, A., & Jalaiani, H. 2013. Effects of chitosan enriched with a-tocopherol coating on trout quality and shelf-life during refrigerated storage. Reef Resources Assessment and Management Technical Paper, 38:497-509. Varela, P., & Fiszman, S.M. 2011. Hydrocolloids in fried food: a review. Journal of Food Hyrocolloids, 25(8):1801-1812. Weilmeir, D.M., & Regenstein, J.M. 2004. Antioxidant properties of phosphates and other additives during the storage of raw mackerel and lake trout. Journal of Food Science, 69(2):102-108. Yu, X.L., Li, X.B., Xu, X.L., & Zhou, G.H. 2007. Coating with sodium alginate and its effects on the functional properties and structure of frozen pork. Journal of Muscle Foods, 19(4):333-351. Ziaiifar, A.M., Achir, N., Courtois, F., Trezzani, I., & Trystram, G. 2008. Review of mechanisms, conditions, and factors involved in the oil uptake phenomenon during the deep-fat frying process. Journal of Food Science and Technology, 43(8):1410-1423.